If you're old enough to read this, it's too late to do anything about it, but a new study finds that lifetime earnings are affected by the level of testosterone to which one is exposed in the womb, as determined by finger length. It might sound far-fetched, but the study by researchers from the Higher School of Economics uses prior research which has shown that many of the skills that lead to a successful life are linked to what is known as the 2D:4D ratio. Yes, it is finger-length we're talking about, but this is not intended to be any kind of snide insinuation about the length of a certain set of presidential digits. The 2D:4D findings far predate the political rise of Donald Trump, famously called a "short-fingered vulgarian" by a New York magazine. 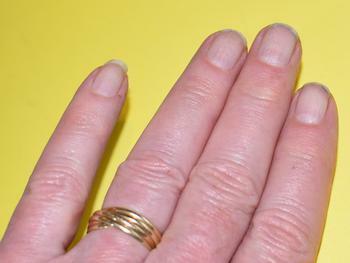 It's not gross finger length that's at issue, though, but rather relative finger length -- specifically the ratio of the index and ring fingers, considered a reliable reflection of the level of perinatal testosterone, the male hormone of the mother that acts on the development of the offspring during pregnancy. To put it more simply, the longer the index finger, the higher the testosterone level. And as we know, higher testosterone is generally considered to equate to male behavior, "correlated with traits like risk-taking and aggressiveness," as the researchers put it. The latest study uses Russian data to show the link between the 2D:4D ratio and a person's income. The study was published in the journal Economics and Human Biology. Reserchers conducted a regression analysis of 1,600 men and women between the ages of 25 and 60, calculating their 2D:4D ratio which was described as a "specialized apparatus." In addition, the respondents, whose identities remained anonymous, were asked a number of questions concerning income and salaries. The results showed a negative correlation between the income and 2D:4D ratios of women. In other words, the higher the salary, the lower the ratio. The effect was negative even when taking into account salary predictors such as gender, age, education level, job position, and the position's economic sector. Interestingly, the same association was found for men but only after taking into account their level of education. This could mean that "more masculine" men need to be tamed by education before being released into the job market if they want to do well. More research is needed to finger the exact mechanism at work here, the researchers conceded.